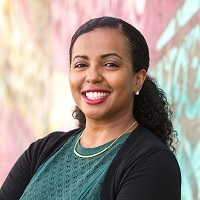 With 15 years of experience in media and communications, Bilen Mesfin Packwood is the founder and principal of Change Consulting, an Oakland, Calif.-based social change communications agency. Change Consulting offers integrated communications, content development and marketing, digital media and earned media consulting services to help mission-driven organizations achieve their programmatic, policy and fundraising goals. She has established a reputation as a trusted strategic communicator and advisor to some of Northern California’s leading changemakers. Current clients include Rosenberg Foundation, Californians for Safety and Justice, California Executives’ Alliance to Expand Opportunities for Boys and Men of Color, Center for Youth Wellness and Women’s Foundation of California. As a journalist, Bilen has written for the Associated Press, the Nashville Tennessean, Edutopia and Art & Antiques, among other publications. She has a Master’s in Journalism from the University of California, Berkeley, and a BA in English from Vanderbilt University in Nashville, Tennessee. Bilen is also the co-founder of the Change Media Scholarship Fund, a partnership with Youth Impact Hub that awards scholarships to youth of color to produce media for social impact. She serves on the Board of the Public Relations Society of America’s San Francisco chapter.